Have you considered using your second home as an investment rather than a maintenance nightmare every time you decide to stay for a few weeks every year? Maybe you've looked into it but you end up feeling anxiety over housekeeping, maintenance, marketing, and midnight calls from tenants complaining about ants in the kitchen, so you end up doing nothing with your investment property and just hope the real estate market continues to climb so your home or condo may some day be worth the investment. On average, our vacation homes generate $40,000-$60,000 in annual rental revenue at an average year round occupancy of 50-70%. Vacation rentals are the smart choice for your investment property due to the fact that unlike long term rentals, someone is checking your property on a weekly basis cleaning and maintaining your investment. List your furnished home in our rental inventory and collect checks each month and say goodbye to tenants who leave you with a paint and carpet remodel bill. My 2nd Home is now accepting vacation properties nationwide. We offer professional vacation rental marketing and long-term property management services in all areas including top ski, metropolitan, ocean front and recreational destinations. Some cities and municipalities have restrictions regarding vacation rentals, we will make sure you are always in compliance with local and state laws. My 2nd Home also offers real estate services through our partners. So if you are considering buying a vacation home, cabin, beach front property or condo, contact us for expert real estate assistance. We have over 15 years management experience in hospitality as well as a very impressive track record managing time shares, homes and condos. Owning a Vacation Home is a fun and profitable experience and My 2nd Home is able to provide vacation rental property management assistance with everything you need. The following article offers 7 reasons you should choose My 2nd Home to help you manage your vacation rental. Your earliest renters decide whether you’ll hit the ground running with five-star reviews or have an uphill climb overcoming initial negative feedback. Modern guest expectations are high, which means you’ll need to provide your guests with a professional-caliber rental to earn their good favor. That doesn’t mean your quaint-but-not-palatial cottage doesn’t have a chance, though. Every size, type, and location of property can earn five-star reviews from the outset – As long as you’re providing these 7 essentials. Your very first impression comes down to what your guests can see in your listing’s photos – and whether it matches what they see when they first open the door. Creating an inviting space is important. Renters like to feel they’re in a deliberately designed space. If your furniture looks like it was thrown together from a thrift store, or you haven’t bothered to so much as hang a picture for a little warmth, your guests won’t feel like the space is inviting. Taking the time to coordinate your furniture, hang some art, and buy matching linens is a worthwhile use of your time. If you’re not confident in your own sense of decor, My 2nd Home would be happy to help with decorating ideas. If your appliances, furniture, or lighting fixtures are several decades old, it is definitely time for an update. The vacation rental market is a competitive business with high-dollar investors hiring top designers to create beautiful vacation properties. You don't have to spend that kind of money to get your share of the market, but at the same time, you also need to compete. Go ahead and shop your competition, browse through websites offering vacation rentals and see which properties catch your eye. The truth is, the nicer your investment property looks, the easier it will be to rent to guests willing to pay a slightly higher price for luxury, and those guests tend to be better renters on average. The importance of the right amenities can’t be overstated. Your guests will filter their searches on the major listing sites by the amenities they want, and if you lack the basic amenities nearly everyone looks for, your rental won’t be viewed – or booked. The best amenities are the often ones we don’t think of as “extras.” You probably don’t think of a microwave as an amenity, but you definitely notice when there’s no way to heat your leftovers. 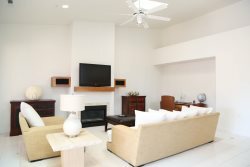 Plenty of extra linens, WiFi, and a television set are all basic amenities that most guests will expect to see in a rental. Providing individually packaged soaps and shampoos isn’t expected in a vacation rental, but guests appreciate them! Including fresh-ground coffee, hot chocolate, and microwave popcorn is another great way to kick your rental off with rave reviews. My 2nd Home provides a starter pack of amenities for all guests. We make sure the kitchens are well stocked with dishes, cups, pots, pans, and cooking utensils as well as a basic spices for cooking. We know what it takes to go the extra mile for your guest – it's just what we do. Guests today expect to be able to reach you immediately if they need assistance or have a question about the property. If they can’t reach you, they’ll be frustrated and annoyed which is not your best route to a great review. It is crucial to establish a fast and reliable way of communicating with your guests from the beginning. My 2nd Home provides a 24/7 number where renters can either phone us (for serious problems) or text (for questions like “Is there a spatula in the kitchen?”). We will always be “on call,” so you don't have to. Your guests expect everything in your property to function. At home, they wouldn’t mind changing out a burned-out light bulb or calling the plumber if the sink backs up – but this is their vacation, and they spent good money to stay at a property where they wouldn’t have to worry about household annoyances. This means you’ll need a more proactive approach to household maintenance. Rather than waiting until something stops working, My 2nd Home performs routine maintenance regularly to be sure everything is in tip-top shape for our arriving guests. We know that if we stay well ahead of burned-out bulbs, lawn and roof maintenance, and touching up any wear and tear around the property, your rental will always look its best – and renters will be pleased to find absolutely no problems to disrupt their stay. Many rental owners try to save money by insisting that their guests supply their own basic necessities like toilet paper and paper towels. Invariably, guests wind up feeling they didn’t receive very good value for money – and their displeasure is often reflected in their reviews. We provide enough toilet paper so your guests don’t need to pick up their own for a weekend stay. You are not running a hotel with an endless supply of amenities, but My 2nd Home provides enough amenities that your guest will not have to run to the store the minute they arrive. We make sure they have laundry detergent, dish soap, and sponges to clean with – and we are rewarded with great reviews. Our guests appreciate that we were thoughtful enough to remember these basics, and they mention this thoughtfulness in reviews – bringing you even more business. We know your vacation rental area like the back of our hand, and our guests always appreciate a local's opinion on where to hike, bike, dine, and play. There are a lot of things to see and do, and we love to share our experience with our guests. We enthusiastically provide our guests with the inside scoop on where the best restaurants, shops, and adventures can be found. My 2nd Home has gone the extra mile, we have partnered with local businesses to provide discounts especially for our guests with coupons or discount codes. We've discovered our guests love that feeling of exclusivity. Local flavor isn’t something a generic hotel can provide, and not every owner takes the time! My 2nd Home knows that if we treat our guests like we’re welcoming friends to the area, we've found they reward us with great reviews. Our guests expect a professional experience – but they decided on a vacation rental because they liked the sense of connecting with another human being’s home instead of a sterile hotel room. We foster that sense of connection by leaving something special from My 2nd Home to our guest. A note of welcome or a small gift are always supplied because we know it makes our guests feel like we were specifically looking forward to their stay. When our guests inquire, we keep an ear out for an indication that there’s a special reason behind the trip they’re taking to our area. If our guests are enjoying an anniversary, a birthday celebration, or another special event, we mention it in a note or supply an appropriate gift – this thoughtfulness is always rewarded with rave reviews. Securing positive reviews isn’t difficult – it just takes a little forethought and investment in the small touches that make all the difference to our guests. My 2nd Home offers professionalism and ease of mind in knowing that your investment property is in good hands. Whether this is your first investment property, or you are an experienced owner with a history of vacation rentals under your belt, we would love to work with you. With so many factors to consider, it’s nice to know you don’t have to go it alone. Having a knowledgeable, experienced partner can help you ensure your bases are covered while taking the most demanding aspects of ownership off of your plate. Find out how we make owners’ lives simpler – and their properties more profitable!